My subconscious is a genius! A couple of weeks ago, my girlfriend and I were up visiting her family in Savannah. While we were up there, we decided to check out the Wormsloe Plantation, famous for its avenue of live oaks. As we were driving down the gravel road, I found a spot that I found aesthetically pleasing and decided to pull over. I looked behind me and there were one or two cars coming that had followed us in, but they weren’t pulled over–I wasn’t in their way. Ahead of me, a few people had pulled over to shoot photos a bit further down. This, of course, is no problem. They paid to be in the park as well, and as a landscape photographer I realize that patience is a huge virtue and I could wait until they were done shooting their photos. 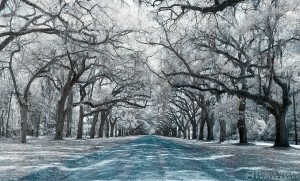 The image I had in mind was a panel-type panorama in infrared. I wanted a certain depth of field yet a fairly wide-angled shot. Shooting at 105mm at f/4 would work pretty well, but it would take quite a few images to accomplish (it ended up taking right around 50). I got out of the car and glanced behind me and saw a truck pull into the park and drive right by the visitor center (where you’re required to stop and pay) and just stop at the base of the road. I waited a moment and realized that they were sitting there. I assumed they were going to get out and pay or maybe they were waiting for me. So I walk out into the middle of the road and start shooting. One or two cars come by in both directions throughout the shooting, but I just waved them by and kept shooting. They’re not travelling too quickly and I really wasn’t in the way. He proceeded to pull in front of me and pulled over about 150 yards down the way–right in my shot. The point of this post, I suppose, is to state what I’ve already stated: photography requires patience. You can’t just walk up to a place (or drive up), point your camera at something, and move on. It just doesn’t work that way. As I said in a previous post, it takes perseverance and you often have to return to a spot dozens of times before you get a satisfactory shot. But, more importantly, while you’re in the spot, you have to wait on the right conditions. Clouds change. Light changes. People may walk into your shot (often right as the light hits exactly the right moment). But you wait… and you deal with it. Lastly, you don’t intentionally walk into someone else’s shot. You don’t purposely get in the way. It’s one thing for people to randomly and accidentally walk through your frame, but it’s another for the guy to do it just to be a prick. It’s completely clear to me that he is an amateur photographer because no professional would act so completely unprofessionally. For what it’s worth, I’m not thrilled with my shot. I may return back to that location a few times, but it’s rather expensive to get in and I’m not sure the payoff would be worth it. It’s a neat place to visit, but I wasn’t feeling it photographically. I had a lot more fun exploring the rest of the park and seeing the historical aspects. 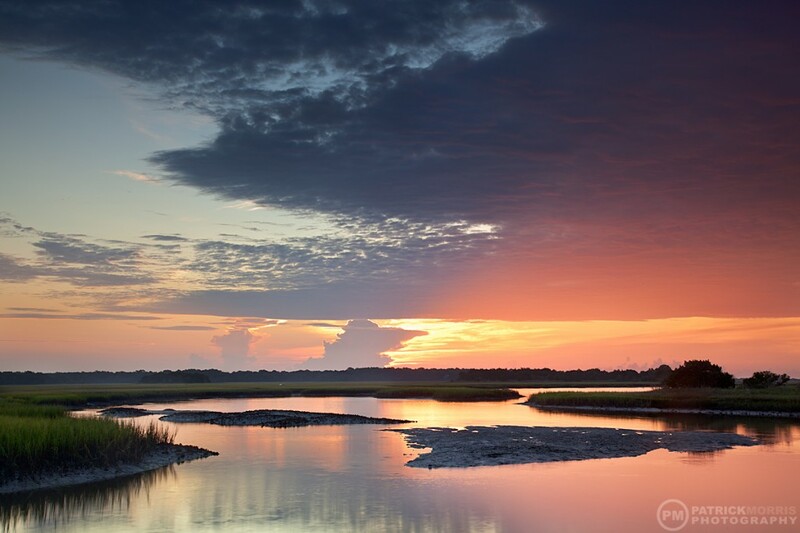 Low tide can be a horrible time to shoot. There’s usually not a lot of wave action at the beach, Big Talbot’s trees are completely out of the water, and anywhere else just looks like mud. All the same, I woke up early for no apparent reason and decided to go shooting. The water vapor and infrared GOES images looked decent enough. We east coast people don’t have it as easy as the west coast people do. They can plan a sunset based on visible satellite and their own observations. There’s always a large amount of guesswork that goes into what a sunrise/sunset will look like, but it’s even more guesswork to do a sunrise. I digress. I chose to go to Cedar Point since I haven’t been out there since March. There are very few compositions to shoot as you’re pretty much stuck on a dock or walking around in shin-deep mud. I still like it–until the jon boat owners show up to attempt ruining my shots when the light just starts to get good. Before the boat owners show up, it’s so peacefully quiet. It’s a happy place. I sat here and watched these thunderheads develop from mere tiny cumulus clouds into full blown thunderheads. It’s amazing how quickly they developed: less than an hour. Note the lack of noise in the shadows. I’ve finally started to perfect the Uni-WB STTR method. It’s the closest thing to exposing for shadows/zone system style shooting one can do on a digital. Remember: all of the information resides in the highlights. I think I may teach a workshop on this method soon if anyone is interested. It can really maximize your sensor’s capabilities and give you buttery smooth images. About a year ago, I got a Slik Sprint Pro II tripod. It is amazingly lightweight and very small when travelling, but has 4 sections on each leg which make it tall enough for a 6’3″ dude like me. Hands down, I love this tripod. I got it on a recommendation from Patrick Smith and I haven’t regretted it. 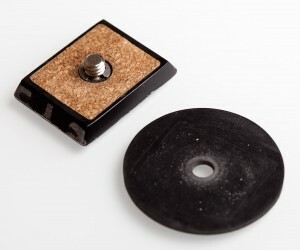 The downside, though, is that Slik decided to use cork on the quick release plate. Why? Is rubber really that expensive? Along with the plate’s diminutive size, this causes it to have a very poor grip on the camera. As a result, when shooting in a portrait orientation, the camera has a tendency to rotate on the screw and not sit still. I cannot tell you how many lost shots I’ve gotten not only because of the camera moving during the shot, but just out of frustration and giving up. Now, I could go order a nice head for the tripod and drop a hundred dollars. Yes, that would be nice. But I’m broke. Instead, I was using my Panosaurus pano head one day and realized it had a neoprene washer on the vertical arm to prevent it from doing the very same thing I was seeking to stop. Ding! Last weekend, I went to Home Depot and grabbed a 1 1/4″ neoprene washer with a 1/4″ hole. I threw it between the plate and the camera and I’m happy to report the problem is completely solved. My grand total? $0.73 before tax. And that’s a lot better than a $125 ball head. It’s finally happened. I’ve decided to start a blog. I miss my photography, and it’s time to get back into it. One of the ways I think I can keep myself motivated is to blog about the world of photography. Who knows who will read this, but perhaps some lone Google user might find one of my posts informative in the future. Here’s hoping I’m helpful, anyway. If you have no idea who I am nor why you should bother even reading this blog, please feel free to visit the homepage at http://www.patrickmorrisphoto.com. There, you can take a look at some of my photos (which, by the way, I need to update very badly!) and read a bit about me. Welcome to my world and I hope you enjoy!